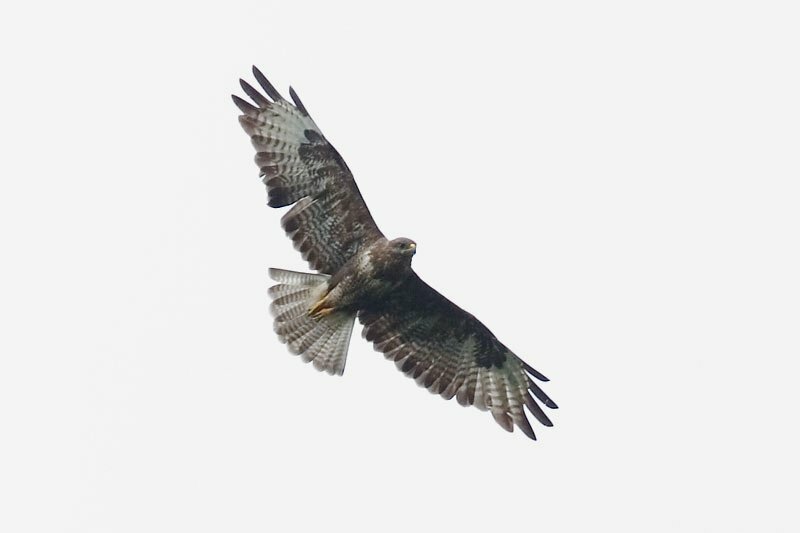 Hawks and Buzzards, Buteo, Alphabetic list of world's buteos. North America. As both terms are ambiguous, buteo is sometimes used instead, for example, by the Peregrine Fund. The large and widespread Accipiter genus includes goshawks, sparrowhawks, the Sharp-shinned Hawk and others. These are mainly woodland birds with long tails and high visual acuity, hunting by sudden dashes from a concealed perch. the family which includes the "true hawks" as well as eagles, kites, harriers and buzzards. Buteos range in size from the Roadside Hawk, which averages 270 grams and 35 cm long, to the Ferruginous Hawk and Upland Buzzard, both at 1,350 grams and 60 cm long. They are noted for their broad wings and sturdy builds. The Buteos frequently soar on thermals at mid-day over openings and are most frequently seen while doing this. They inhabit a wide range of habitats across the world but tend to prefer some access to both clearings and trees. All Buteo species are to some extent opportunistic when it comes to hunting, and will prey on almost any type of small animal as it becomes available to them. However, most have a strong preference for small mammals and among these mostly rodents. Rodents of almost every family in the world are somewhere predated by Buteo species. Birds are taken occasionally, as well, although most small birds can successfully evade them. Mid-sized birds, such as waterfowl, corvids, pigeons and gamebirds, are most often taken, but even these are generally taken when distracted. Other prey may include snakes, lizards, frogs, salamanders, fish, and even various invertebrates, especially beetles. Carrion is eaten occasionally by most species, but is almost always secondary to live prey. Prey is often spotted from a great distance while soaring and is set down upon while circling down to the ground. Other Buteo species may prefer to ambush prey by pouncing down to the ground directly from a perch. The Buteo hawks include many of the most widely distributed and best-known raptors in the world. Examples include the Red-tailed Hawk of North America, the Common Buzzard of Eurasia, and the Roadside Hawk of tropical Central and South America. Most Northern Hemisphere species are at least partially migratory. In North America, species such as Broad-winged Hawks and Swainson's Hawks are known for their huge numbers (often called "kettles") while passing over major migratory flyways in the fall. Other species known as "buzzard"